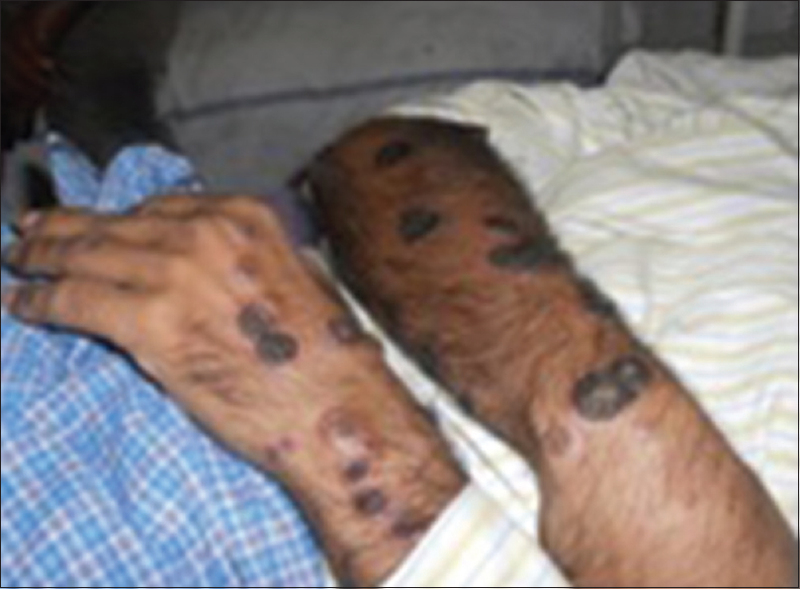 A 34 year old man was brought by his relatives to the OPD of Kayachikitsa in the month of April 2011 in a severe condition [Figure 1], [Figure 2], [Figure 3]. Clinical examination revealed red colored foul smelling maculo-papular lesions all over body including scalp, nails, palms, soles. There was also swelling of both the knee and shoulder joints and was unable to walk due to severe pain. He had also restricted movements of both shoulders. Previous history revealed that he was suffering from above illness since 2003. The symptoms used to get aggravated very fast in a very short period in the month of February to May of every year so much so that every time he had to be admitted for treatment where he was treated with systemic antibiotics, corticosteroids, immunosuppressants and non-steroidal anti-inflammatory drugs. In spite of continuous medication, his condition was deteriorating. He was admitted in Kayachikitsa ward. On examination, his prakṛti (body constitution) was pitta-kaphaja. His agni bala (Digestive power) and Sharir bala (physique) was avara (poor). No specific etiological factor (occupation related or life style related) was found in history. The laboratory studies showed the following: hemoglobin 11.4 g/dl, leukocytes 6400/cu mm, neutrophils 68%, lymphocytes 26%, Eosinophils 01%, Monocytes 01%, ESR 96 mm/h. The urine analysis showed no albumin, pus cells, epithelial cells or RBCs. Considering the history, clinical examination and investigations, following treatment was given [Table 1]. 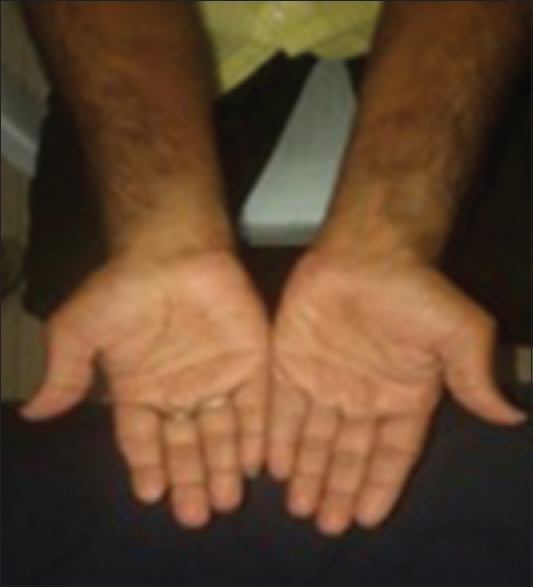 There was gradual improvement in the skin lesions within eight days [Figure 4] and [Figure 5]. The scales started shedding and Papular lesions converted into macules. Itching and burning sensation also decreased. Svedana (sudation) of both knees and shoulder was helpful in relieving pain and restricted movements. 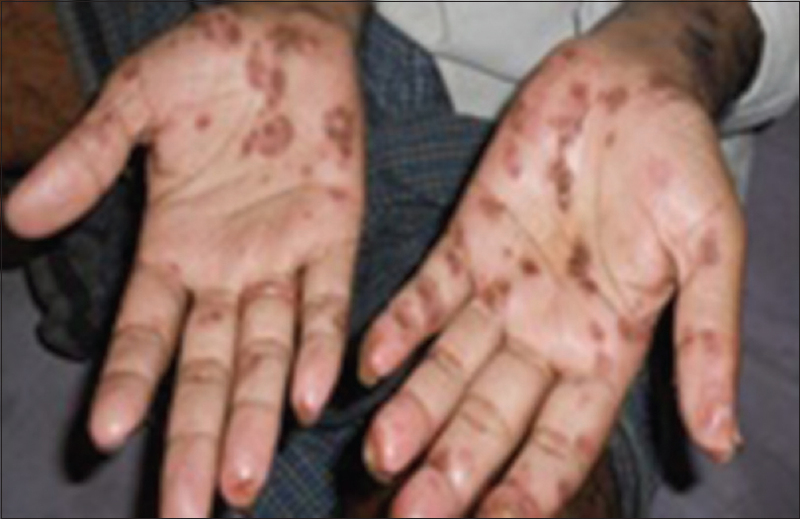 It was difficult to correlate Reiter's syndrome with any one of the different Kuṣṭha rogas (skin diseases) described in Ayurveda. 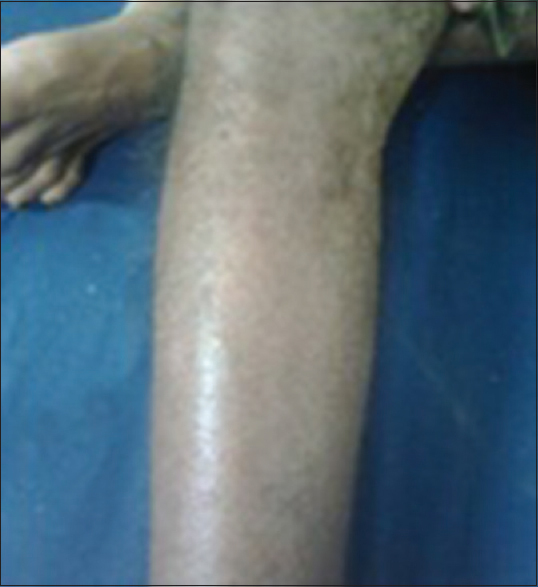 Some of the features of Kaphaja and Pittaja visarpa (one of the skin disorders) were found in this patient. The treatment was decided on the basis of predominance of doṣa and dhātu (~body tissues) involvement. The symptoms indicated vitiation of pitta and kapha doṣa and rasa and rakta dhātu. Treatment was planned according to treatment principles governing vitiation of Raktavāha srotas (~macro and microchannels of blood). Triphalā and Nimbapatra (leaves of Azadirachta indica) were used to made decoction for the cleansing of skin lesions because Triphalā is anti-inflammatory, astringent and Neem is an antiseptic. These were helpful in shedding of the scales of skin and preventing secondary infection. The Cikitsā Sthāna of the SuśrutaSaṃhitā recommends Triphalā among medicines that are good for purifying a wound.Mṛdu virecana (Mild purgation) was given with Harītakī cūrṇa which proved helpful for koṣṭha śuddhi (~bowel cleaning). 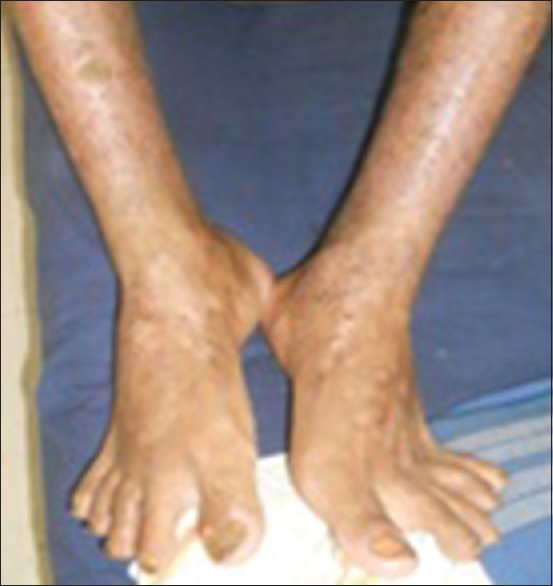 In Reiter's syndrome, there is involvement of nails and joints. It is because of this that Panñcatikta ghṛta guggulu was selected. It is a combination of drugs having Tikta Rasa (bitter taste) dominance. Tikta Rasa is commonly used in skin diseases and as a vehicle to deliver medicines at the level of Asthi dhātu (~bony tissue). Guggulu is a proven anti-inflammatory agent. Gandhaka Rasāyana is a Sulphur based preparation. It is considered as a Rasāyana (rejuvenator) which promotes positive health and vigor, retards aging process and increases longevity in individuals by increasing immunity in the body, thus increasing resistance against the factors causing ailments. It is indicated in kuṣṭha (skin disorders). Mahāmañjiṣṭhādi Kvātha is described as Rakta śodhaka (~ remover of blood impurity), āmapācaka and viṣahara (detoxifier). Karañja oil was used due to its Kaṇḍughna (anti-itching) and kṛmighna (anti-infective) property. It is commonly used in different skin diseases., It is also cost effective. Guḍūcī ghanavaṭi was continuously used for one month. It has been used in Ayurvedic preparations for the treatment of various ailments throughout the centuries. It is used as a rasā yana to improve the immune system and body resistance against infections. After completion of two months treatment, patient was apparently well. In the Next year (2012), he again had skin lesions but the intensity was not severe. He responded well to Panñcatiktaghṛta guggulu and Mahāmañjiṣṭhādi Kvātha with the previous dose for one month. From the year 2013 to 2016, patient was advised Guḍūcī Ghana 500 mg twice a day from the month of January to April as a preventive measure. 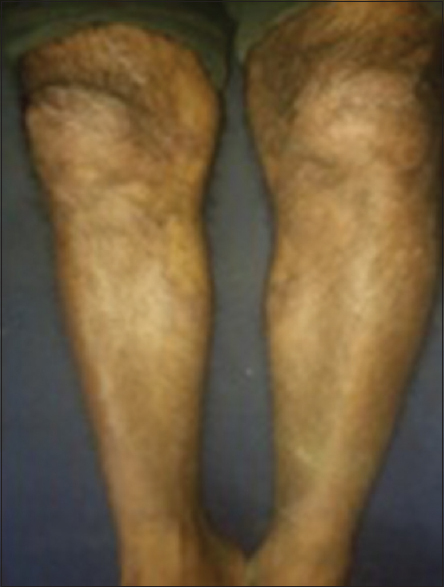 He got significant relief in skin lesions as well as joint pain and his quality of life was markedly improved [Figure 6], [Figure 7], [Figure 8]. Patient is still on regular follow up and free from Arthritis and cutaneous lesions. This case study shows that Reiter's syndrome can be successfully managed with Ayurvedic intervention. It is supportive for further research in Reiter syndrome and other autoimmune dermatological disorders. Pavlica L, Mitrović D, Mladenović V, Popović M, Krstić S, Andelković Z, et al. 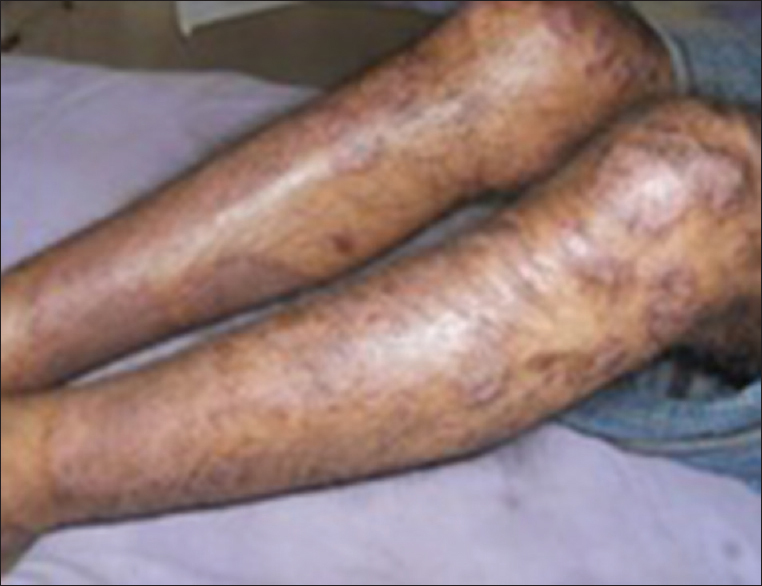 Reiter's syndrome – Analysis of 187 patients. Vojnosanit Pregl 1997;54:437-46. Schneider JM, Matthews JH, Graham BS. Reiter's syndrome. Cutis 2003;71:198-200. Ram Narayan Sharma. Ayurved Sar Sangraha. 18th ed. Nagpur: Baidyanath Ayurved Bhawan; 1997. p. 517. Deshpande AP, Jawalgekar RR. editors. Dravyaguna Vigyan. Part 2. Anmol Prakashan Poona; 2002. p. 425. Ram Narayan Sharma. Ayurved Sar Sangraha. 18th ed. Nagpur: Baidyanath Ayurved Bhawan; 1997. p. 291. Ram Narayan Sharma. Ayurved Sar Sangraha. 18th ed. Nagpur: Baidyanath Ayurved Bhawan; 1997. p. 713. Deshpande AP, Jawalgekar RR, editors. Dravyaguna Vigyan. Part 2. Anmol Prakashan Poona; 2002. p. 452. Deshpande AP, Jawalgekar RR, editors. Dravyaguna Vigyan. Part 2. Anmol Prakashan Poona; 2002. p. 574. Deshpande AP, Jawalgekar RR, editors. Dravyaguna Vigyan. Part 2. Anmol Prakashan Poona; 2002. p. 342. Susruta, Bhishagratna KK. An English Translation of the Sushruta Samhita, Based on Original Sanskrit Text. Vol. 2. Susruta: Bhishagratna, Kunja Lal, Kaviraj; 1907. p. 344. Singh RH. The Holistic Principles of Ayurvedic Medicine. Vol. 14. Delhi: Chaukhamba Sanskrit Pratishthan; 2003. p. 220. Laxmipathi Sashtri Rasayanadhikara. Yogaratnakara. 3rd ed. Varanasi: Chaukhambha Sanskrit Sansthan Publication; 1983. p. 501. Bhattacharya A, Ghosal S, Bhattacharya SK. Anti-oxidant effect of Withania somnifera glycowithanolides in chronic footshock stress-induced perturbations of oxidative free radical scavenging enzymes and lipid peroxidation in rat frontal cortex and striatum. J Ethnopharmacol 2001;74:1-6. Anbalagan K, Sadique J. Influence of an Indian medicine (Ashwagandha) on acute-phase reactants in inflammation. Indian J Exp Biol 1981;19:245-9. Dhuley JN. Adaptogenic and cardioprotective action of Ashwagandha in rats and frogs. J Ethnopharmacol 2007;70:57-63. Ayurvedic Pharmacopoeia of India. Part 1. Vol. 2. Delhi: Government of India, Ministry of Health and Family Welfare, Department of Ayush; 1999. p. 80-7. Pandey G. Dravya Guna Vijnan. Part 2. 1st ed. Varanasi: Krishnadas Academy; 2001. p. 128-9. Ayurvedic Pharmacopoeia of India. Part I. 1st ed., Vol. 1. New Delhi: Department of Ayush, Ministry of Health and FW; 2001. p. 53-5.